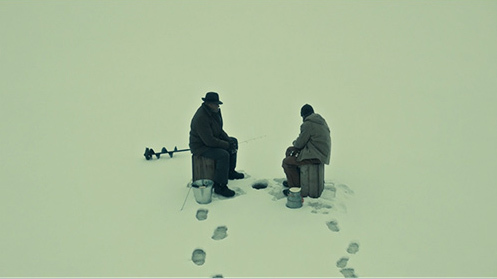 In Hannibal, a frequent technique utilised by the writers is the use of metaphor, particularly relating to animals. These devices build and develop our understanding of characterisation and shifting inter-character dynamics. Additionally, by conjuring the images and associations attached to particular creatures, the creators are able to heighten our perception of conflict in the diegesis. The animal metaphors aid our comprehension of the dominant murder narrative as one that is primal and natural. The relationship between murderer and victim is framed through the dialogue (and often visuals) as predator and prey. Simply put, Hannibal riffs on Darwinian ideas of survival of the fittest by coding the humans as animals. 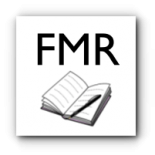 These references are frequent, foregrounded and rely on the audience’s shared understanding of a perceived predation hierarchy in the animal kingdom. In this piece, I’m going to explore some of the instances of this specific device in relation to Hannibal, Will and other characters in order to highlight how very crucial they are in reinforcing the dominant reading. This is the first symbolic animal connection made with our eponymous antagonist. It is one that is made with some dramatic irony for poor Franklyn. Given the preceding obvious introduction of Lecter, it is foregrounded that there is, indeed, a lion in the room and Franklyn is oblivious. This symbolic alignment adorns Dr Lecter with the qualities associated with the lion; we understand that he is a dangerous top predator, one that kills for food. The ‘devouring’ is a key verb in relation to this character and his iconic proclivities. The lion is a symbol of vicious and aggressive masculine pride. In short, he is a king. Also in Apéritif there is an oneiric sequence of Will in the shower which features a stag with feathered haunches in night-time woodland, realised just beyond the shower curtain. 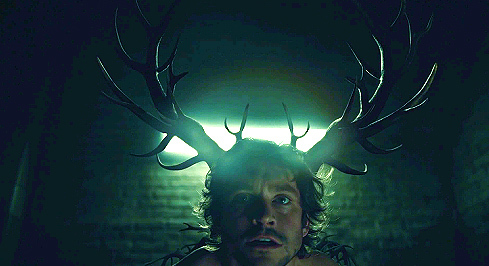 The Ravenstag, as it has become known, is an important totem within the Hanniverse. Initially is it the manifestation in Will’s unconscious mind of the Chesapeake Ripper. We know that Hannibal is the same killer, and so we understand that the Ravenstag is a symbol for Hannibal. Its unnatural hybridity elevates its status in the narrative to something mythological and magical; but interestingly, it is something that is not inherently disturbing or overtly evil – unlike the wendigo, another mythological dream symbol for Hannibal in Will’s mind. Both of the animal elements that are conjoined in this image of the Ravenstag are created by a connection to the first Ripper crime scene that Will attends; the carrion birds are shooed from the body of Cassie Boyle. Her naked form is arranged with some aesthetic concern atop a dead stag. This crime scene nominally motivates the creation of this subconscious signifier of Lecter in Will’s psychological landscape. The combination of the animalistic elements also feed our perception of Hannibal; through the Ravenstag, Lecter is romanticised and mythologised for us. The raven is commonly part of the iconography of horror; it signifies death as it scavenges from predated carcasses. Despite this gruesome reality, we have a tendency to romanticise them and they have a long-standing potent association with the horror genre. Edgar Allen Poe’s iconic poem The Raven is, of course, a crucial cultural artefact in reinforcing that connection. The use of the stag, however, is somewhat more unexpected as a symbol for a serial killer and cannibal. The stag is an enduring image which connotes masculine power and dominance. We associate this animal with nobility, strength, male aggression and male competition. Interestingly, though, it is not a carnivore, not a predator. Instead, we associate this image with hunting and prey. 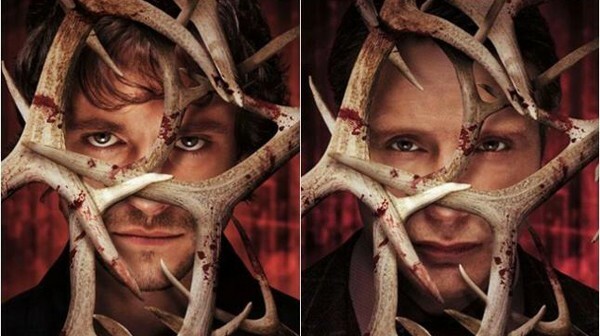 Perhaps this is a reflection of Will and Hannibal’s relationship as the hunter and hunted. More than that, we may understand that Hannibal will be a trophy if Will manages to defeat him. In season two, Will’s knowledge of Hannibal’s true nature forces a shift in the animal metaphors used. However, once more conflicting symbolic creatures are chosen to reflect the way in which the protagonist views the antagonist. In Kaiseki, Will says to Crawford: “You let the fox in the henhouse.” This analogy points at Will’s perception of Hannibal as the cunning, vicious and unnecessarily, perversely destructive predator. The hens in this case are the BAU team; innocents of inferior intellect in comparison to the wily fox. Jack: How do you catch a fish that isn’t hungry? Will: I’m a good fisherman, Jack. Jack: You hook ’em, I’ll land ’em. 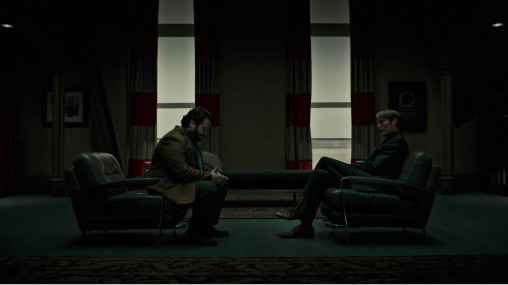 The exchange and use of the metaphor is a not-so-subtle hint that Jack has finally come around to Will’s point of view and the two are beginning to conspire against Hannibal. As with the image of the stag as a substitute for the doctor, the fish metaphor particularly reinforces Will’s intention to hunt and assert his dominance over Hannibal. In this symbolic association, Will is the fisherman, the one with the superior intellect and physical ability. In fact, placing Hannibal as a fish significantly diminishes his threat and power. Hannibal is not characterised by Will as a shark – an association which would readily conjure notions of his true nature – but as a fish; a generic term for any member of the paraphyletic taxonomic rank. Fish are simple creatures; fast but ultimately and usually prey for bigger, meaner beasts. This paints Will as a protagonist who is choosing to frame the world in a way which is preferable to him. From the outset of the first season, Will’s fondness for fly-fishing has been emphasised. This metaphor then, is more about Will than Hannibal; by characterising Hannibal as simple, achievable and pleasurable prey, we understand that our protagonist is empowering himself to take down the antagonist. 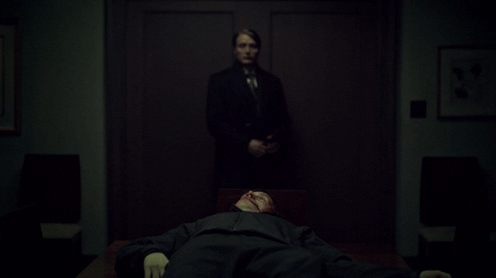 This connection also conveys something of how Will will attempt to get the better of Hannibal; he will have to develop his empathetic understanding of his adversary in order to create the right lure and be very, very patient. However, in Su-zakana, Hannibal also acknowledges himself in a similar manner. Jack, Hannibal and Will discuss the trout they are sharing at dinner. Hannibal comments: “More flavorful and firm than farmed specimens, I find the trout to be a very Nietzsche-ian fish. Trials of his wild existence find its way into the flavor of the flesh.” This is later developed with this line: “We will absorb this experience; it will change us, we all Nietzsche-ian fish in that regard.” The reference to Neitzsche highlights the idea that Hannibal perceives the importance of a disregard for objective truth in evolving into one’s most desirable and self-actualised incarnation – a desirability which is free from the constraints of society (the farm in his metaphor) and is reinforced by the phrase “wild existence”. 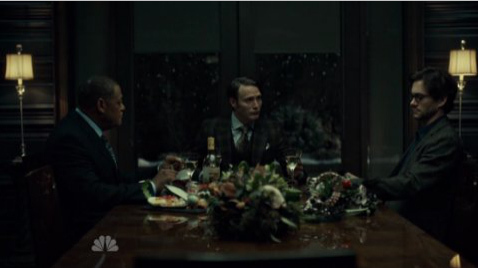 However during the dinner conversation, Hannibal uses the inclusive pronoun “we”; simultaneously accepting his own wildness, adaptability but also his own conventional vulnerability. He is not alone in this vulnerability; he also unites Will and Jack with himself in the metaphor, imbuing them with the same qualities. Initially this adds to the enigma for the outcome of the season, but on a second viewing can be read as subtle foreshadowing. Similarly, it is often Hannibal who uses animal metaphors to establish a dynamic between himself and Will which reflects Hannibal’s perceived superiority over Will. In Apéritif, Hannibal brings Will breakfast and explains how he perceives Will as they dine. Hannibal says that Will is “the mongoose I want under the house while the snakes slither by.” Here, Hannibal implies he is the master of the house who permits Will’s presence because of his usefulness. The mongoose, as a predator, is one with a deceptive furry and cute exterior, one that belies the reality of its viciousness. The snakes are the other killers, who Will is charged with conquering. In this trinity of symbols, Hannibal perceives himself as significantly more dominant than both Will and the other killers they will encounter on their adventures. This analogy reveals the antagonist’s superiority complex. In a conversation about Will in Amuse-Bouche, Hannibal states that he thinks that Jack sees Will as a “broken pony”.This characterisation tells us about how Hannibal has observed Jack’s perception of Will. A pony is perceived as less than a horse (an animal we associate with grace, strength, nobility and gentleness). It is a work animal or a little girl’s pet at best. Either way, that characterisation of “pony” arguably emasculates Will. The polysemic nature of the word “broken” also illuminates how Jack thinks about him. Broken means damaged, unable to serve its function; so perhaps Jack worries that Will is or will become unable to help in apprehending the killers that Crawford is tasked with bringing to justice. Broken, in equine circles also means to be tamed, to be made obedient and, as a result, made useful. These are conflicting readings of the word, but in both functions Jack is placed as the master and protector of the ponies. This full exchange suggests that Jack has lost team members before. Later we learn about Miriam Lass, the former BAU agent that is presumed dead. In Potage, Hannibal suggests that Will is a bloodhound. This image also reinforces the idea of Will’s essential nature and purpose; his ability to understand the pathology of killers. The bloodhound is another working animal, one which is part of a pack and which follows a master. In Kaiseki, Hannibal comes back to this metaphor and clearly ascribes Jack the status of pack master. What is equally interesting, though, is the fact that this symbol further builds on Will’s associations with dogs. One of the key elements of initial characterisation of our complex and antisocial protagonist in Aperitif is the solace and comfort that he finds with his pack of strays; his canine family where he is alpha dog. In Futamono, Alana again emphasises this connection between the dogs and Will. She says: “I look at these dogs; I see the best part of Will.” That “best part” is the positive associations we have with dogs applied directly to Will. Dogs are most commonly associated with loyalty, trust and protection. Through repeatedly reinforcing his relationship with his dogs and through dialogue which likens Will to canines, we understand that Will also has these innately positive qualities. However, by association, this reinforces his vulnerability. He will need an appropriately protective and caring master in order to be functional, healthy and happy. Bernardone: There’s a great deal I could train even you to do, Will. Will: That kind of friendship can keep you on your toes. Bernardone: Animals, they do have friendships just like us. We’re the same. There is a close up of Will during his line, suggesting the moment has an increased significance. Perhaps he realises that Hannibal is training him to become a killer and, by extension, a closer companion. By the end of this episode, Will kills Randall Tier and serves the body up to Hannibal on his dining table. This exchange forces Will to evaluate his relationship with Hannibal and subtly prompts acceptance that in order to defeat Lecter, he must appear to be an apt pupil. Will’s transformation is manifested visually in season two on a number of occasions, for example Mukozuke in the first half of the season and Shiizakana in the second half. The character development; Will’s mutation from underdog to worthy adversary is illuminated, in part, by sequences which depict Will’s metamorphosis into a stag. These moments are presented as Will’s subjective hallucinations. From the perspective of the dominant reading, we might understand that this is Will’s fear that he is somehow becoming like Hannibal; turning into an object of self-hate. However, symbolically, it can be argued that our understandings of the potency of the stag as a symbol of masculinity, aggression, competition and pride (the same associations linked to Lecter in the first season) are now being transferred to Will. 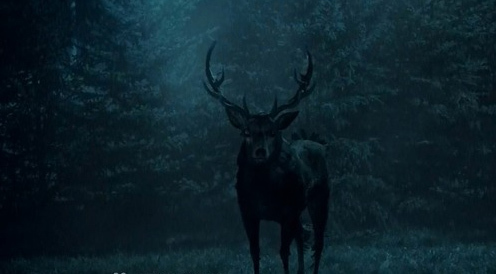 On the flipside, as with Hannibal, the stag’s status as the hunted creature also hints at the fact that this adaptation is not without its vulnerabilities. 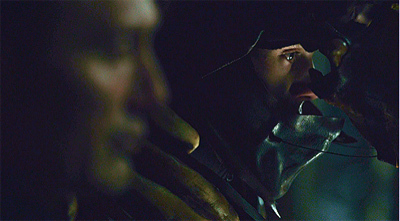 Later in the season, Hannibal uses a curious creature metaphor when contemplating his own influence on Will. He says: “I can feed the caterpillar, I can whisper through the chrysalis, but what hatches, follows its own nature and is beyond me.” In this, Hannibal reveals his perception of his part in shaping the outcomes of others. He acknowledges the power of nature and his potential to nurture. This is in part foreshadowing and in reminding us of the past; Hannibal has continually manipulated and cultivated Will. The line also reminds us of the importance of nature. 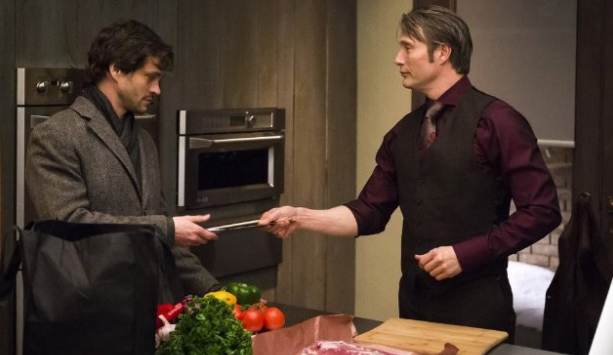 At this point in the season’s arc, Hannibal is beginning to believe that Will might be becoming a potential protégé. Despite the telling conversation at the beginning of Su-Zakana between Jack and Will about fishing, there are several moments in the back half of the season where it appears as if Will is aligning himself with Hannibal. 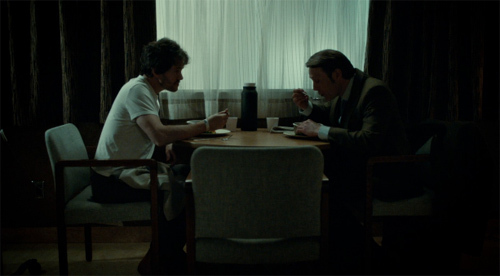 Will’s attack on Freddie Lounds in Naka-Choko and his subsequent cooking session with Hannibal are such moments. However, this idea about what hatches following its own nature and how that is outside of Hannibal’s control reinforces the idea that Will’s nature has always been innately positive – loyal, trusting, protective, etc. 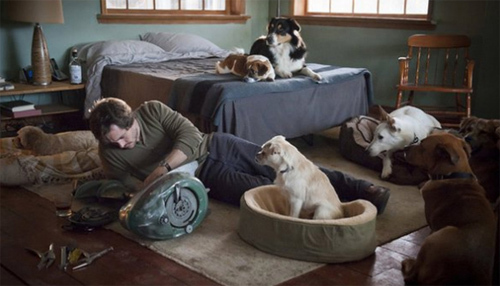 The use of animal metaphors in Hannibal is not confined exclusively to Will Graham and Hannibal Lecter. At times, in other episodes these devises are deployed to vividly conjure associations with the natural world which work to emphasise the conflicts as natural and essential. For example, in Mukozuke murderous orderly and Will Graham fan boy Matthew Brown suggests an alliance to Will thusly: “…imagine if the hawks started working together.” Here, he and Will (whom he believes to be a serial killer) are the hawks. This characterisation demonstrates that Brown believes he shares some natural kinship with Will. He believes them both to be superior, as connoted by the connection with aerial predators. This entry was posted on June 22, 2015 by lorimori and tagged analysis, hannibal.